University of Mary Washington is a public university located in Fredericksburg, Virginia that boasts a strong Liberal Arts core. The school overall is quite impressive but being that this institution does things differently compared to other Virginia learning institutions may draw some away. Read on to find out why. (Cost) Easily a top factor in looking at universities. UMW is not horribly expensive at all, in fact, if one were to count out living space (assuming youre not already living at home in Fredericksburg), the total tuition cost would not even exceed $7,500. 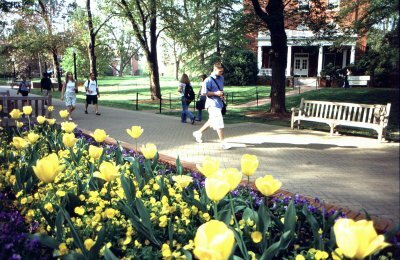 A school such as UMW is one of the reasons why Virginia institutions are cheaper in comparison to other states. (Academics) The very reason why anyone goes to a higher institution of learning. UMW has academically challenging classes which involve a lot of studying and reading, which can be a big problem for hands-on learners however. While one can learn so much from the exceptionally knowledgeable professors, those who lead busy lives are going to have a hard time going to school full time while attempting 12 plus credits worth of classes. A issue some have take is with the fact that UMW fuses the Arts and the Sciences together; at most universities, those attempting a Bachelors of Science at one university may be shocked to learn that foreign language is a REQUIREMENT at this school regardless of ones major. Even if one transferred from James Madison, while attempting a BS, to UMW and never took foreign language classes in college, that individual is STILL going to have to complete the 200 level of whatever language. UMW is VERY picky with credit transfers as well. Even if it seems that your classes will transfer, one should very much get in contact with an academic advisor to make sure of it. There are people who came from other universities whom have more than a semesters worth of credits taken away so be cautious. Another issue some will take is the fact that UMW does not offer minors. Even though the school is considering allowing minor programs, though no agreement has been reached yet, it should be known that if a minor is desired, another school may be more beneficial. Despite unusual academic expectations, UMW offers strong curriculums. (Social Life) To be honest, I commute so I cannot say for sure how the social life is at UMW but it seems quite involved. Walking around campus, one can notice a slew of fliers for campus events so it would seem like the social life at UMW is sufficient enough. (Structure) How one gets their bureaucratic chores done on campus is different from other universities as well. At UMW, the vast majority of academic and financial issues are usually completed by the student alone via the internet. It is also important to note (for commuters at least) parking on campus is quite specific in the sense that ones car has to be in a specific park of the parking garage at specific days of the week (i.e. commuter with red stickers HAVE TO park on the second floor of the parking garage). If one knows how to take care of themselves to a degree, then getting school based chores completed should not be too difficult.